Up until now, it has not been possible to install super large EVC systems. However, this has all changed – you can now have as many as 8,064 outstations on a single system! We agree that it is extremely unlikely that a system of this size would be required, but what it means is that the restrictions have now been lifted! Overall system (master) control is carried out by the use of a graphic layout on a touch screen PC. The graphic on the screen is multi-layer – providing the user with an easy-to-use, and instantly recognisable interface for the system. 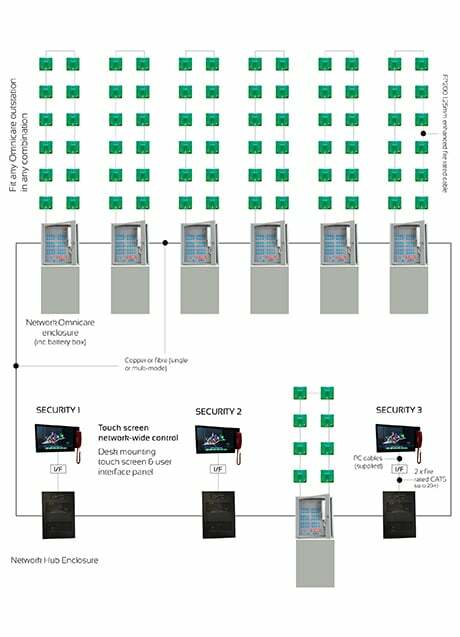 OmnicarePLUS is not limited to a single touch screen control point – additional ones can be added to the system, enabling placement in alternative control or security rooms. These will be slaves/mimic panels – unless full control is transferred to the panel due to compromise of the master control point or if required by the user(s). For ‘local area’ control (i.e. control of the outstations on a single floor/area/building block) specially designed Omnicare panels are employed. Up to 64 outstations can be connected to a local area control panel. Each local area control panel is able to communicate with the outstations connected to that unit. It is possible to connect up to 126 Omnicare panels, each with 64 outstations – making it possible to connect up to 8,064 remotes! The master control point can communicate with every single outstation on the system (one at a time, as is the requirement of BS5839-9). Compatible with the entire range of Omnicare outstations. Choice of copper and fibre (single or multi-mode) networking. Multi-layer graphical touch screen control – see the location of the remote calling. Automatic incoming call queuing, with indication of number of waiting calls. Multiple touch screen control locations, with optional mimicking of status and faults. Incoming call logging and audio recording via touchscreen control locations. All site wiring fully monitored for faults. Calls can be accepted locally at Omnicare panels. Optional access control at touch screen control locations. Each OmnicarePLUS project is unique. We have a qualified team that will design, build and test the system to suit your specification. If you have a requirement for a particularly large EVC system then please contact our Sales Team who will be happy to discuss your options.